1xRun: Tell us a bit about this piece, is the original sold? Gregory Siff: I used to work for Disney back in the day and thought I’d give a shout out to the past. The original was hung at a Disney themed group show at Graffik Gallery in London. It is sold. All three portraits, Snow White, Mickey, and Cinderella, were done with a thin cap and were hit on the first shot. I like to work that way. I’m most proud of the Mickey. 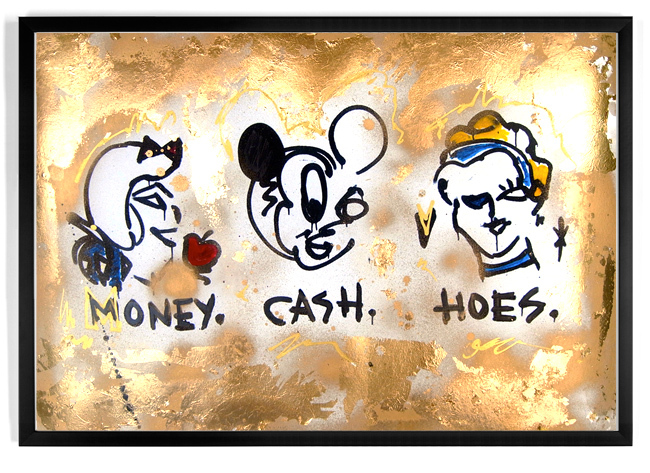 It was painted in 2012 in my treehouse studio garage using a mix of acrylic, marker, spray-paint and Gold-Leaf for the embellished edition here. 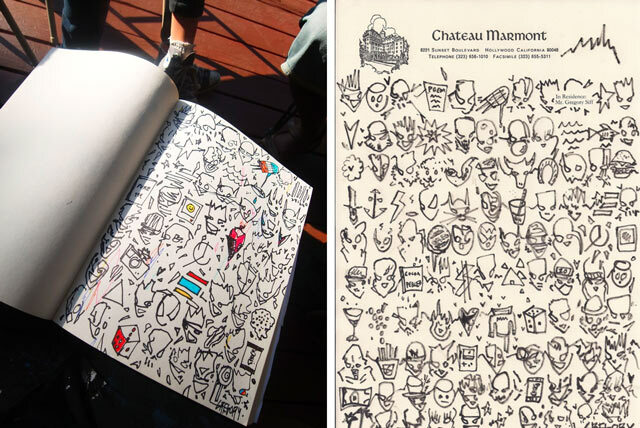 Gregory Siff: I wanted to make a comment on modern day rap music, pop culture and icons. I like hitting the piece right of the bat. Sometimes it doesn’t work that way. 1xRun:How long did the piece take? Gregory Siff: The Gold Leaf editions are thick and almost look like currency when they are held. You can feel the texture of the spray-paint and the leaf and the shape of the print is rectangular like a dollar bill, just bigger. Gregory Siff: Because it’s a moment in time. It’s fun. It’s a play on an icon that everyone grew up with as a kid, when you get older you realize it’s about making paper. 1xRun:Describe this print in one gut reaction word. 1xRun: You’ve been staying busy since your last RUN, what have you been up to? Gregory Siff: Painting walls, painting clothes, painting canvas, living life, staying up late and doing hoodrat stuff with my friends. I painted a pair of Vans sneakers and they were exhibited at The Whitney Museum of American Art, that was an amazing honor. I also painted at San Diego Comic Con this year for Wired Magazine and Kia doing custom paint jobs and model cars. Also while I was at Comic Con I linked up with the producers the film The Darkness Descending starring Danny Trejo and I painted a portrait of him that he signed which will be auctioned off to raise money for Hollywood- Arts.org. 10,000 youth lack a bed to call their own. Hollywood Arts educates, empowers and prepares homeless students ages 13-24 for lives of self-sufficiency. Great Actor. Great cause. I have been keeping true to the art and painting everyday. 1xRun: What do you have coming up in the next 2-3 months? 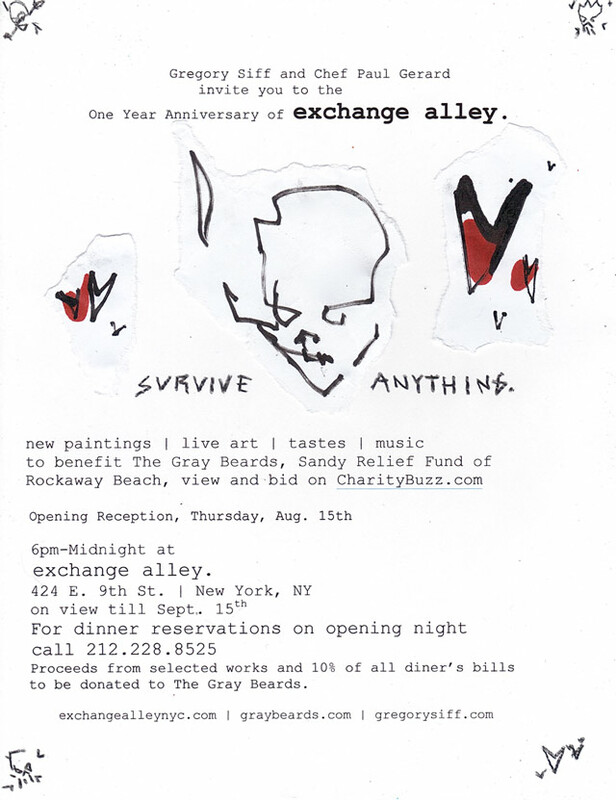 Gregory Siff: I have an important show that will raise money for The Gray Beards who aid Hurricane Sandy victims in my hometown of Rockaway Beach New York. It’s on Aug 15th at Exchange Alley, 424 E. 9th St. Chef Paul Gerard has always been a supporter and collector of my art and his restaurant, Exchange Alley, is having it’s one year anniversary party which will be a night of live art, new paintings, taste, and music. His skills are unreal. We met at the Soho Grand and he was the chef at Soho House as well and we have become close friends ever since. We were both born in Brooklyn. He bought my paintings when I just moved to LA.